OriginTrail Community - All you need to know about OriginTrail! The website is made for and by the Trace community, for everything you need to know about OriginTrail. 3. Why is the Trace token needed? 1. How much for a masternode? 2. How to setup an OT testnet node? 3. Where to get support for the OT testnet node? 4. What are the best wallets to store your TRAC tokens? 1. How much $TRAC for a masternode? 2. What is the OT node ROI? 3. When will OT mainnet nodes go live? 4. What was the $TRAC ICO price? 5. What is the Trace Alliance? OriginTrail is a blockchain powered data exchange protocol enabling businesses to speak the same language with integrity. OriginTrail protocol runs on an off-chain decentralized peer to peer network, called the OriginTrail Decentralized Network (ODN). It enables peers on the network to negotiate services, transfer, process and retrieve data, verify it’s integrity and availability and reimburse the provider nodes. This solution minimizes the amount of data stored on the blockchain in order to reduce cost and inefficiency. OriginTrail incorporates blockchain as the platform to ensure data integrity and trusted payments. All the data entering the system gets immutably “fingerprinted” in the blockchain (using a cryptographic hash) which provides for a tamper-proof mechanism for supply chain data. The blockchain layer allows the OriginTrail network to utilize different blockchains for fingerprinting which provides flexibility and ensures longevity of the protocol by not having “blockchain lock-in” to one single platform. OriginTrail enables seamless and automatic data connection and interoperability between IT systems of different stakeholders in multi-organisation supply chains with consensus mechanisms for ensuring integrity of data. Interoperability is delivered by integrating globally recognised GS1 standards for Master Data (descriptive attributes for products), Transaction Data (related to business relations), Visibility Data (related to tracing and tracking). Other data sets will include IoT and compliance data. Consensus among entities in supply chain is achieved by performing cross-reference checks every time a new data set is added to the protocol. This ensures the entire supply chain is in accords regarding a particular batch of products. If there is no consensus, discrepancies can be quickly reported, investigated and reconciled. 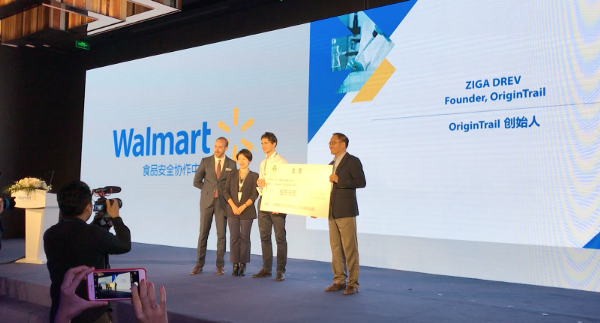 Once the automatic data input is setup by the service providers (from supply chain ERPs, IoT devices, online and brick & mortar retails stores, etc.) it is introduced to Data Creator (DC) nodes which disseminate the data in the network to other Data Holder (DH) nodes for safekeeping, fingerprinting, performing data standardization checks, consensus checks and creating connections with other already available supply chain data in the system. Finally, supply chain data is read from the nodes by the decentralized applications from the application layer. All the nodes are reimbursed for these services by Trace tokens in the amounts agreed upon with a bidding mechanism. The Trace Token is an ERC20 compatible token on Ethereum. It is the means of compensation between supply chain data producers and data consumers on one side and the OriginTrail node holders on the other. It provides the incentive to the nodes in the peer to peer network to perform the system functionalities. The OriginTrail incentive model introduces a novel form of a token staking mechanism implemented in order to discourage potential malicious behaviour within the network. It differs from the more common model of staking in decentralized networks where a certain, usually relatively large amount of tokens, is set as collateral in order to qualify as a validator (i.e. Ethereum Casper) or to perform a different set of services (i.e. Dash Tier 2 Masternode) within a system. TRAC is staked whilst nodes fulfill agreements to store data, convert to graph & hash form and replicate. For more information check out OriginTrail’s token demand model which was independently audited by a third-party. We’ve written an extensive guide on how to setup a new secure Ubuntu server for the first time and installing the OriginTrail node through Docker. You can read this extensive guide on our blog. Community member malexaffey wrote and extensive guide on how to setup the testnet node on DigitalOcean. Check out his blog on our website. For more information check out the OriginTrail website node setup guide. KuCoin offers an inter-platform and high accessibility real-time exchange service. Users can easily and conveniently proceed with trades, deposits and withdrawals via the KuCoin App Android or Iphone or official KuCoin website. KuCoin aims to provide users digital asset transactions and exchange services which are very safe and convenient. This is achieved by integrating premium assets worldwide and constructing a state of the art transaction platform. HitBTC claims to be the world’s most advanced cryptocurrency exchange. Since 2013, HitBTC has been providing markets for Bitcoin, Ethereum, Litecoin, Dogecoin, Monero, USDT, and more than 300 cryptocurrencies in total. Created by outstanding technical minds, high-level finance professionals and experienced traders. IDEX is the fastest and most user friendly decentralized Ethereum exchange available. With support for market orders, instant order books, and instant gas-free cancels, IDEX provides traders with the speed of a centralized exchange combined with the ironclad security of decentralization (including support for MetaMask and Ledger Wallet). IDEX is the only decentralized exchange with real-time, high-throughput trading. IDEX combines the experience of a centralized exchange with the security of blockchain-based settlement. TRAC is a ERC20 based token, any ETH wallet can hold TRAC. MyEtherWallet is a great option! It’s a free, open-source, client-side interface for generating Ethereum wallets & more. Interact with the Ethereum blockchain easily & securely. Double-check the URL ( myetherwallet.com ) before unlocking your wallet. 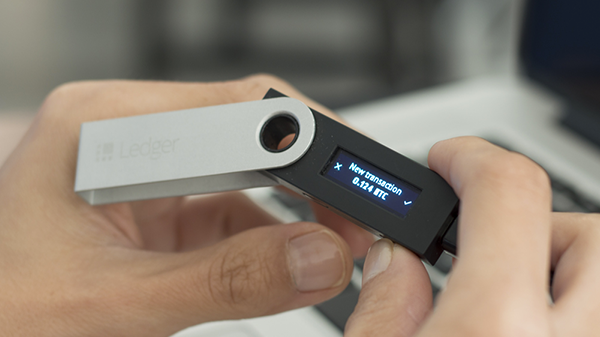 Ledger Nano S is a Bitcoin, Ethereum, Altcoins, & of course , vTRAC hardware wallet, based on robust safety features for storing cryptographic assets and securing digital payments. It connects to any computer (USB) and embeds a secure OLED display to double-check and confirm each transaction with a single tap on its side buttons. When you own cryptocurrencies, you need to protect your confidential data and the access to your funds. With Ledger Nano S, secrets like private keys are never exposed: sensitive operations are isolated inside your hardware wallet within a state-of-the-art Secure Element, locked by a PIN code. Transactions can’t get tampered with, they are physically verified on the embedded screen with a simple press of a button. Check out the Ledger website for more information. TREZOR is a hardware wallet providing advanced security for handling bitcoin & altcoin private keys . Unlike traditional cold storage methods (offline storage or paper wallet), TREZOR is able to make secure payments without exposing your private keys to a potentially compromised computer. TREZOR’s security model is based on the principle of zero trust. The zero trust principle says that any part of a secure system could at some point be compromised. Your TREZOR device will continue to protect your bitcoins or altcoins even in the case that the TREZOR Wallet is hacked and your computer is infected by a virus. This is important. The whole point of TREZOR is being more secure than a traditional web wallet or desktop bitcoin application. Check out the TREZOR website for more information. OriginTrail does not have a masternode system. Nodes will be incentivized to perform tasks within the OriginTrail Decentralized Network (ODN). There is no minimum requirement to run an OT node. Trace tokens will be locked up in an escrow account once an agreement is reached via Smart Contract (more details to come regarding the market bidding mechanism). Therefore, the number of tokens a node has available for staking will determine the possible reward amounts (more tokens = more agreements). A node’s reputation will also be taken into account when agreements are matched with the winning bid. The number of tokens a node has available for staking will determine the possible reward amounts (more tokens = more agreements). A node’s reputation will also be taken into account when agreements are matched with the winning bid. Specific numbers are not yet available. The OriginTrail decentralized network (ODN) mainnet will launch in Q3 of 2018. A specific date is not yet known. The Trace Alliance is a collaboration partnership hub connecting businesses, startups, academics, business leaders and technology vendors with supply chain subject matter experts. The collaborative effort of the alliance resolves different organisational challenges in supply chains management. The Trace Alliance was formed to establish common ground for the prompt and effective utilisation of blockchain up to its full potential. Support from different industry leaders is key for optimal platform development. The Trace Alliance allows companies to receive early access to developing technologies, facilitating new application deployment centered around the OriginTrail protocol. OriginTrail has a website dedicated to the Trace Alliance with all the information and partnerships. Click here to go to the Trace Alliance website!